Offer detailed, exportable reports on all test functions. 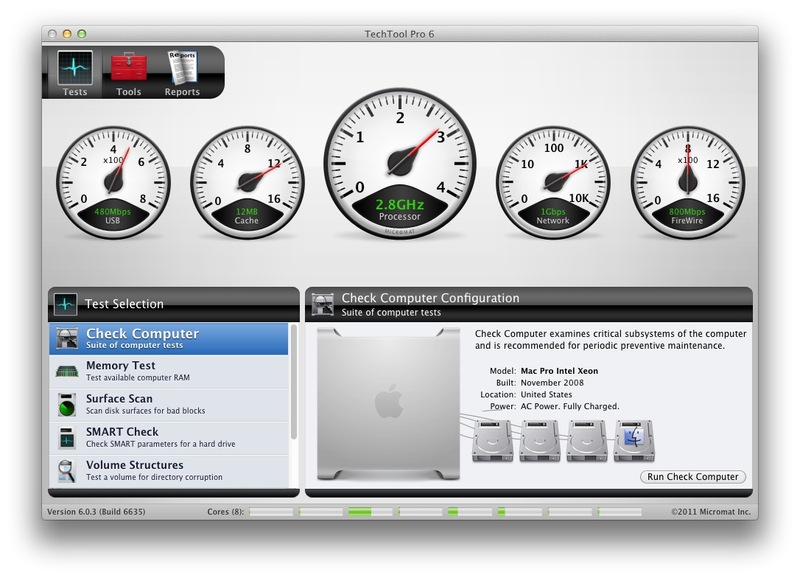 Figure 1: This opening screen is also a diagnostic screen: it indicates that TechTool Pro is running on a Mac Pro with four drives, that the USB ports are running at 480 megabits per second, the CPU has a 12 megabyte cache, the processor is running at 2.8 GHz, the network is operating at gigabit speed, the FireWire port is operating at 800 megabits per second and, along the bottom margin, it indicates the computer has eight processor cores, only one of which is particularly busy. Click on image for larger version. This is a long list of functions for one utility package. All the functions work, so rather than explain them in detail, we’ll look at those functions that are exceptional. One of the most valuable functions offered by TechTool is its comprehensive system test. From the opening screen, click on Check Computer, type in an administer name and password, and then go do something else for an hour or two. TechTool will check the health of the your computer’s memory, video memory, hard drive SMART status, a file structure check of all attached volumes, a volume structure check of all attached volumes, and a disk surface scan of all attached volumes. Depending on the size of any attached hard drives, this can take a long time, but a Mac that passes all these tests is probably a very healthy Mac. TechTool’s volume cloning and image cloning options allow you to either duplicate a drive or sync files between volumes, or create a disk image with a number of options. Most of these functions can be done with Disk Utility, though the TechTool interface is far easier to understand. Click on image for a larger version. TechTool’s memory check is also outstanding. It is very common today for Mac users (especially those who belong to user groups) to install more RAM in their Macs. While this is a thrifty option, it comes with a sense of anxiety: did I properly seat the memory card? Is the memory the right type? Is it good memory? 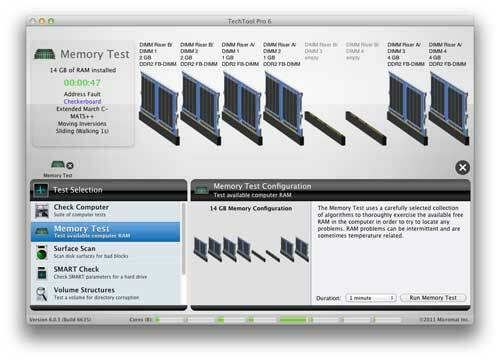 TechTool’s memory check does an outstanding job of testing memory, and does it with an easy to understand set of controls. Disk Utility performs a SMART (Self-Monitoring, Analysis and Reporting Technology) check every time it launches, but the reporting is minimal. 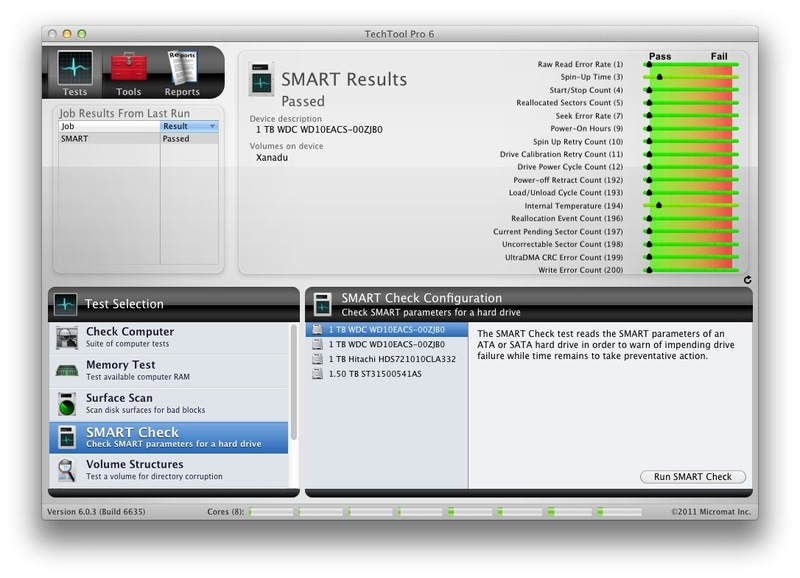 TechTool gives a detailed, colorful report on the SMART status of volumes. Click on image for a larger version. Corrupted files are a problem for most users, chiefly because most users have no idea how to find corrupted files, or associate the problems they may be having with file corruption. TechTool’s File Structures test will check each and every file on a drive and provide a comprehensive report of those files that are corrupted, or improperly classified. This check, which can take hours on a large volume, is a real gem. TechTool has an outstanding memory check function. You have a choice of checks, from a quick, one-minute check to a more exhaustive and comprehensive 90-minute check. The check also gives you a nice graphic showing all installed memory cards, their size and specification. Click on image for a larger version. For the past decade, another commercial utility, Disk Warrior, has developed an almost cult following because it does one trick, and does it well: it can rebuild a damaged volume directory. TechTool also has a Volume Rebuild tool and, while no attempt has been made to compare the two side by side, TechTool has been fully successful every time I’ve tried it. TechTool’sLocal Network check scans the local network and reports back all devices found, reports their IP (Internet) address, and reports back on services found on those devices. In this case, four devices were found (the fourth one claims, curiously, to be a robotic vacuum cleaner), and the highlighted top item is reported as an AirPort Base Station with an Apple File Sharing service and a Samba (Windows file sharing) service. Click on image for a larger version. TechTool has no functions that can be classified as losers. The audio signal check is not particularly useful, but it does work. The eDrive partition tool isn’t needed with Mac OS X 10.7 Lion, which automatically creates a recovery drive as part of the installation process, but it is useful with Mac OS X 10.6 -- but only if you take the time to run the tool and create a partition. Many other functions, as noted, are also available in Disk Utility, without spending a dime. But the Disk Utility interface is looking increasingly dated; few Mac users today even know it exists, and those that do rarely use it for more than a few simple things, such as erasing disks or checking file permissions. Most of the other functions are not nearly as obvious as in TechTool, and for almost every function, TechTool provides far more complete, and colorful, reporting tools. 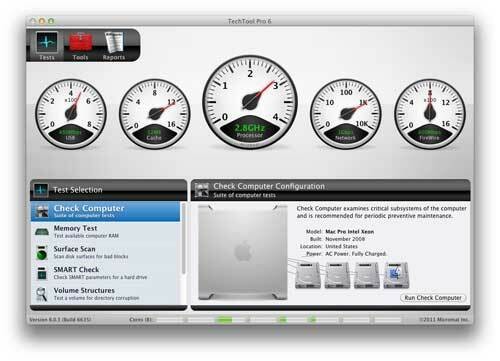 TechTool Pro is the most reliable, most comprehensive, and easiest to use diagnostic package available for Mac OS X. 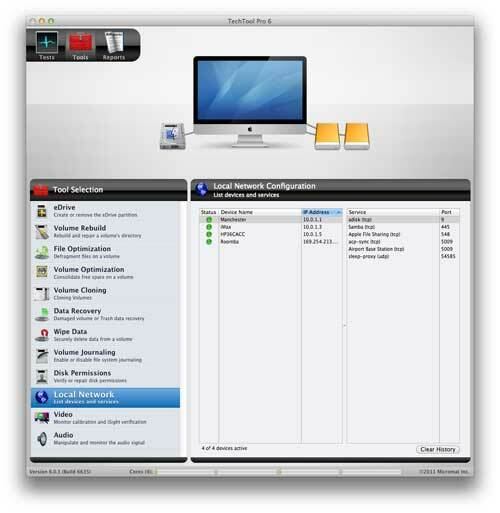 If you would like to go beyond Disk Utility’s capabilities, TechTool Pro is an excellent investment.